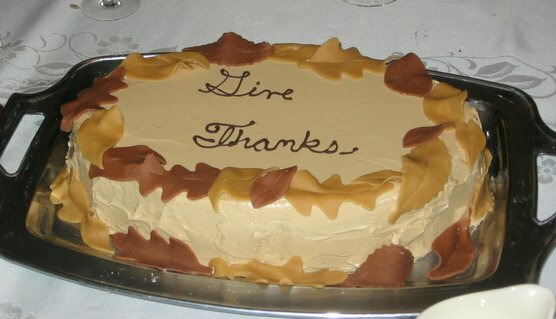 Chocolate cake with coffee buttercream and marzipan leaves - one of the Thanksgiving dishes that actually came out just fine. But I also made a few missteps. The cornbread stuffing was drier than it should have been. Some of the vegetables were a bit cold on serving (I don't know how to handle this without breaking down and buying a food warmer tray). My sweet potato/pecan pie bubbled up and over and made a mess of the floor of the oven, as well as dripping all sorts of stickiness under the crust, making for very messy serving. And then there was the pumpkin cheesecake. I've made quite a few pumpkin cheesecakes and never had a problem. I made this one last weekend, and it looked just fine. I froze it, then thawed it on Thanksgiving day. And in the thawing lay the problem. My cheesecake started to give off water. It was all unmolded on a nice glass cake plate with a lipped edge, and thank goodness for that lip, because otherwise there would have been dripping onto the tablecloth and I had already gotten in trouble by getting chocolate on my mother's tablecloth. I used a paper towel to sop up the liquid, assumed it was just some condensation of some kind, and went about my business. A half-hour later, there had to have been 1/4 cup of liquid around the base of that cake, making my nice gingersnap crust a soggy mess. I couldn't understand it, but I had a theory, a theory I hate to admit on a blog devoted to organic, local ingredients. I hadn't used the hallowed One-Pie can of pumpkin. Instead, I had used an organic canned pumpkin. (I knew better than to use real pumpkin, which even when roasted and drained is too watery for most baking). I had noticed upon taking the pumpking frmo the can that it seemed a little lighter in texture and color than I was used to. This morning, I confirmed with a co-worker, whose wife had had the same problem with organic pumpkin in a pie. I am left in the unfortunate position of having to make a recommendation to AVOID organic pumpkin, at least for custards. Last night I hauled home piles of groceries from the store, baked cornbread and tore up white bread for stuffing, made cranberry sauce, cooked sweet potatoes for pie, gathered my recipes, and made buttercream for a chocolate cake. I have vague ideas about a book I would like to write one day called "French Pastries in Ten Recipes." Basically, there aren't that many things you need to know how to do to make most traditional pastries. You just have to learn the basic recipes and then combine and flavor them in different ways. And one of the basics is buttercream. A lot of people are intimidated by buttercream, and I'm not sure why. There's a common idea that it is fussy and requires a candy thermometer and an advanced degree and possible a sacrifice to St. Honore or something. Not true. Not true at all. At the bakery where I once worked, we made buttercream by putting all the ingredients in the big mixer, lighting a few Sternos under the bowl to warm it all up, and letting 'er rip. It always came out just fine. Put the egg whites and sugar in a bowl over some simmering water. 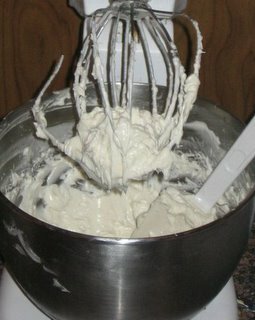 Whisk until the mixture is warm and the sugar is dissolved. Remove from the heat, and whip (preferably with a machine of some kind) until cool. Add in the butter in chunks, and whip until thoroughly combined. If it seems a little stiff, warm it a bit and whip some more. Medium on a stand mixer is best; high will give you some big air bubbles, which only matters if you're doing smallish piping. If it seems a little melty, put it in the fridge, let it cool a bit, then whip again. Buttercream will always come together eventually, it just has to be the right temperature (just a bit higher that room temp is good.) If you make ahead, you will need to warm it a bit and rewhip for the best texture. You can flavor this basic buttercream any which way. I'm planning on adding melted bittersweet chocolate and a little instant coffee dissolved in a tablespoon of Kalhua to this batch. (If I were making this for adults only, I would use bitter chocolate, but bittersweet will yield a more child-friendly result.) As long as you stay under two tablespoons of liquid, you're fine. Extracts, purees, concentrates, liqueurs - add what you like. One of my best buttercreams included nearly a cup of dried apricots, made soft with a soak in rum and simple syrup, then pureed. Tonight I'll make the cake. Cooking at someone else's house is a royal pain in the neck. There are always things you assume everyone has, but you're wrong. Like a whisk. Or Saran Wrap. How can a regular suburban American family not have plastic wrap in the house? It seems impossible, but last Thanksgiving, my parents didn't have plastic wrap OR aluminum foil. I actually had one more picture. That's it. Myself, my boyfriend, two of my co-workers and respective significant other/spouse, a high-school friend of mine, a grade school friend of my boyfriend, two Siamese cats and not nearly enough chairs. The kitchen table smooshed up against my painting table, both of which had been dragged into the center of the living room, which had been emptied of whatever furniture I could push into the alcove. I dream of a dining room like some people dream of yachts. I’ve even picked out the paint and had prints framed for this non-existent dining room. I’m not kidding. The meatballs were mixed and rolled but not cooked the day before. (And a good thing, too – the leftovers were good, but s little squishy.) The dressing was made the day before and just needed cooking off. The red peppers were made the day before and just required heating up. The potatoes were boiled the day before and roasted that day. The strudel was baked the afternoon of the party. The chicken was roasted just before dinner. The big winners were the mushrooms, the meatballs and the strudel. The chickens were good, but I think could have been a bit better. I brined the birds on Thursday, and I think the brining did help keep the flesh moist and flavorful. But I think some of the salt wasn’t properly dissolved, because the tips of the breasts, which were sitting at the bottom of the brining bowl, were too salty. They must have sat in a pool of salt. The rest of the meat was fine, so no worries, just need to make sure all the salt is dissolved next time. After 24 hours in the salt brine, I rinse and towel-dried the birds, and then I did something I had never done before: I air-dried them. Just put them on a rack in the fridge for 36, bare naked. This was supposed to give a particularly crisp skin, and the skin was very good, but when it came time to rub the chickens with the spices, the spices wouldn’t stick to the dry skin. Which is perfectly logical and follows the basic rules of nature, but never occurred to me. Do people spice first? Or do they just do what I did and cheat with a little oil? At any rate, I got the spices on there: 1 teaspoon of smoked Spanish paprika from Penzey’s, 1 teaspoon of Hungarian sweet paprika, and 1 teaspoon of caraway seeds per bird. The spice coating didn’t look as uniform as it normally would on a moist-skinned chicken. But I was serving the birds carved, so that wasn’t much of an issue. I roasted at 425. I would love to roast at 475 or 500 like all the in-crowd cooks do these days, but that would require a better oven, an exhaust fan that worked, and/or a smoke alarm that didn’t go off even when the air is not smoky. 425 did the job. Overall, I would say that the meat was very good, but I would have liked a touch more heat in the spice rub. Maybe hot paprika instead of sweet. 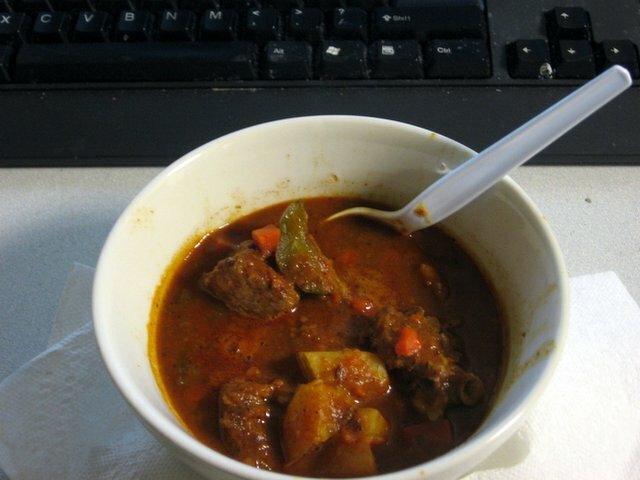 The red peppers paprikash were solidly good and a nice color. This is an easy recipe that really doesn’t require a recipe – just cook some onions until translucent, add paprika, add red peppers in strips, cook a little more, then add some chicken stock and chopped tomato, maybe a little tomato paste, and cook until tender. Very nice. The dressing is one that I love. People weren’t talking about it, but there wasn’t much left, so that’s good. Essentially, you cook shredded cabbage and onions in a bit of oil, add sauerkraut, chopped prunes, chopped apples, a bit of chicken stock, and you’re good. Bake in the bird or out. I frankly forgot all about picture-taking in the fun and the talk and the wine. This is a general problem between me and the camera. Okay, the roasted potatoes. I’ve never managed to get my potatoes the way I want them. One pan came out nice and dark on the bottom, but even though they cooked just as long after I turned them, they never browned the same way on the other side. The other pan never really browned properly at all. What am I doing wrong? The outsides were fairly crispy, the interiors were nice, and the flavor was good (I used beef fat), but why can’t I get them to brown? Do I need that exhaust fan? I think only one or two people actually ate the cranberry relish. It was okay, but just got lost on the table. I suppose I could use the leftovers at Thanksgiving, except that I’m pretty sure no one in my family would eat horseradish. Oh, and no one ate the afterdinner nuts or pomegranate or cheese or candied ginger. I guess there are people out there who actually stop eating when they get full, which seems mighty strange to me. Fortunately, the nuts came in handy for tomfoolery. Walter Jeffries of Sugar Mountain Farm left an important comment on my last post about NAIS. Basically, the government is trying to implement a mandatory animal identification and tracking system, on the argument that they need to be able to track outbreaks among animals. Which sounds reasonable enough. But the system, as currently proposed, is quite simply insane. Everyone who keeps even a single livestock animal - just one chicken or pig - would be required to register the animal with the government, The animal would then be assigned an ID number and possibly a tracking microchip. All movements of the animal off of the farm would be required to be reported. 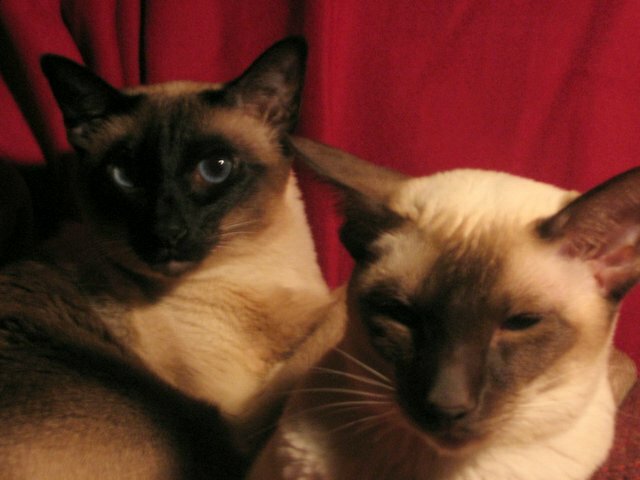 Veterinarians would be required to report unregistered animals. And it goes on and on. How is this evil? Let me count the ways. Food prices in general would rise. Small farmers would be put out of business. It would become even more difficult for people to raise their own food. The winners would be the people who have caused a lot of the problems with safety in the food supply to begin with: Big Agriculture and their factory farms. There has been almost no media attention to NAIS, which is a good thing for the USDA. This plan has something to offend everyone. Small government conservatives don't like the interference of government in personal property. Nutty-crunchy foodie types don't like the attack on local organic farms. Some religious groups don't like the use of identification numbers or certain technologies. Of course, small farmers have everything to lose. And there's plenty to offend animal-rights activists, libertarians, chefs, 4H Club members, anyone concerned with the future of rural and small town America, and Martha-Stewart readers who want their own blue-egg-laying chickens. A powerful coalition could be developed here, if people get the word out. Do your part. I'm taking a little vacation. It will include a dinner party, though, so Monday I should have some good pictures to post. Have a good week, everyone. This recipe is from Please to the Table, with some adjustments. I use it all the time, because the mushrooms are very good and can be made a couple weeks ahead of time, if need be. I love food that can be made ahead. (And I *heart* my deep-freeze, too, but that's another post). Okay. Anya calls for 1 1/2 pounds of white button mushrooms. I always use crimini (or baby bellas, which I believe are just a silly marketing-department-invented name for the same thing). They have a deeper mushroom flavor. I'm sure you could do this with all sort of exotic mushrooms, if you have access to them. Because more often than not I can only get mushrooms in 10 oz packages, I just use two packages. Trim the stem ends to get rid of the tough bit at the very tip, then wash the mushrooms. Usually, the rule is that you have to wipe each mushroom individually with a damp towel, so that the mushrooms don't absorb excess water. But these mushrooms are going into a pot of water anyway, so don't worry about it. Just wash them. Halve any that are huge. Now put them in a pot and squeeze the juice of one fresh lemon all over them, then let them sit for about 5 minutes while you putter around. Here's the water part: Anya calls for 3/4 cup or enough water to cover. I don't know what type of mushroom she was sampling when she decided 3/4 cup would cover 1 1/2 pounds of mushrooms, but it doesn't work. You can't "cover" mushrooms with water anyway, because they float. But I usually use about 2 cups so that every mushroom is at least somewhat immersed. Anya leaves you on your own when it comes to adding the salt. I would say I use about two teaspoons. And here's my personal recipe addition: I throw in 1/2 cup dried mushrooms, quickly rinsed, at this point. Bring the mushrooms to a boil, reduce heat and simmer for ten minutes uncovered. Then take out the mushrooms. Because I use at least twice the water Anya does, I let the mushroom water keep simmering for a couple minutes here to concentrate it a bit. When you decide you've had enough of that, measure out 1 cup of the mushroom-water. Don't discard the rest; throw it into chicken stock. Return the water to the pot along with 1 cup of tarragon vinegar (Anya says 3/4 cup of each, but she's being stingy.) Add a teaspoon of sugar, about a dozen peppercorns, and three bay leaves. If you wanted these hot, this would be a good place to add some red pepper flakes. Bring to a boil, cover, reduce heat, and simmer five minutes. Take off the heat and allow to cool. I've forgotten to let it cool a bunch of times; the mushrooms come out just fine anyway. 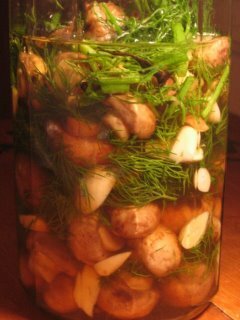 Now, pull out a nice glass jar and layer your mushrooms alternately with roughly chopped dill (Anya says 12 sprigs, I just use a goodly amount) and about 5 or 6 garlic cloves, sliced. 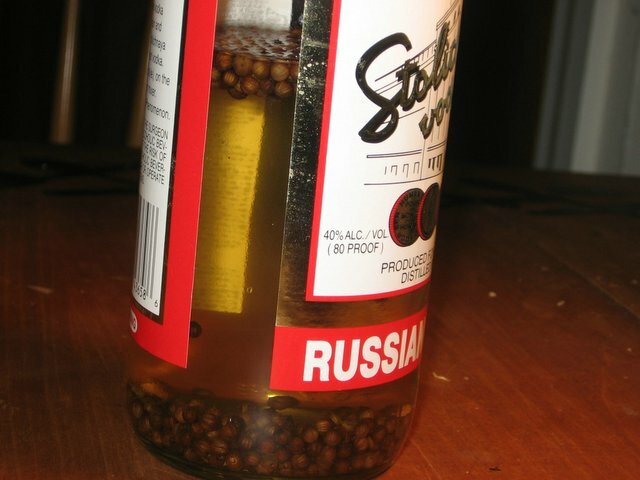 Pour the vinegar mixture over the mushrooms, and then pour in enough olive oil to cover. Refrigerate. You have to wait at least two days before these are ready to eat, and a week is better. 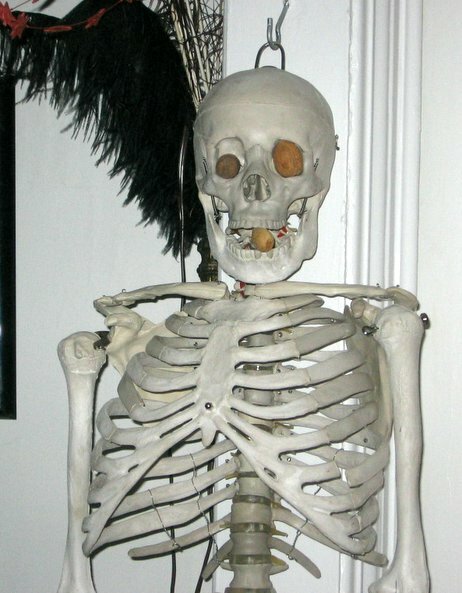 Serve within a month. I like to dig out the dill, which won't look very nice, but leave the garlic cloves, which taste pretty good. I corned my own brisket for the first time last weekend and I would give it an A-. I'll reserve the A+ for a slightly more tender result, maybe fom longer brining or lower heat. But, as usual, the grass-fed beef meant a deep, meaty flavor, and home-brining gave me a less salty corned beef than the store-bought version. I'm pretty salt-sensitive, so that was good by me. And it took all of five minutes to mix the brine and throw the brisket in, so there really wasn't much extra work involved. Given how hard it is to find organic corned beef outside of the St. Patrick sale at Whole Foods, I think I'll be doing this in the future. I also finished the last of the excellent pork chops by browning them in a skillet, then baking them on a bed of sauerkraut mixed with raisins and apple cider, which was great. 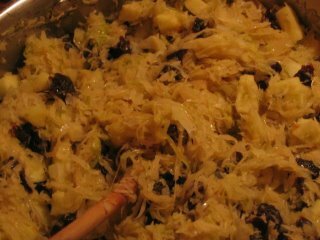 How did I reach my thirties without knowing how good sauerkraut is? It was just never eaten in my house growing up, and I don't encounter it in restaurants. Maybe if I had liked hotdogs, I would have known, but I didn't. I also made a very nice roasted pumpkin soup with one of the sugar pumpkins from my farm share. Nothing exotic, just pumpkin, chicken stock, roasted garlic, some spices, onion, and a bit of cream, pureed until smooth. But good, especially with some tart plain yogurt swirled into the center of the bowl for a bit of contrast. I forgot to take pictures of these things. I never remember to take pictures of dinner at dinnertime, because I'm hungry. Then I have the question: do I take a picture of the leftovers, looking less-than-beautiful despite being tasty, or do I just forget about it? Usually I opt for the latter. * By "soon", I mean "as soon as I can convince a bank to give me a mortage for the entire cost of a home based on my charm and wit. It's not the greatest picture, but it is a delicious and very quick dessert. I've been intending to post this for a while. I was going to make this for the wine-pressing night, since it was appropriate and quick and I didn't have much time to cook. But the day got moved up, so I didn't have any time to cook at all. That was okay; I used a little of the bottle of 2003 homemade I received for services rendered (heave-hoing on the press) to make this for myself over the weekend. I'm not usually crazy about sorbet. It's nice and all, but really I would rather have ice cream. Sorbet is having your dessert and your diet, too. Sorbet is about appreciating the purity of fruit, and appreciation is all very well as it goes, but when was the last time you rolled your eyes in pleasure while appreciating the purity of fruit? I thought not. Puree fruit. Put 1/3 cup pureed blackberries into a saucepan with 1/3 cup sugar and heat while stirring until sugar is dissolved. Allow to cool, then mix with remaining puree and lemon juice. (If you hate seeds more than you hate cleaning sieves, put through a sieve now). Freeze in ice cream freezer. 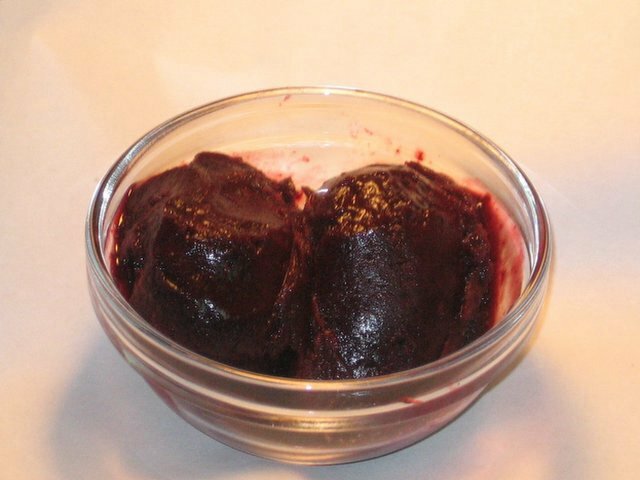 The flavor is powerful enough to give this sorbet an oomph most sorbets lack. It tastes like its color, dark and a bit mysterious and seductive. The only negative thing I have to say about it is that it doesn't scoop very smoothly. I think the alcohol content makes for a more sudden melting point, so the sorbet can quickly go from a little too hard to melted. A minor point, probably easily fixed by putting the sorbet in the fridge to thaw gently. I'm never patient enough for that business. The mouthfeel is fine, though, not icy in the least.